1. Sprinkle steak with combined spices, cook on heated oiled barbecue (or grill or grill pan). Remove from barbecue, cover, stand 10 minutes, then slice thinly. 2. Meanwhile, combine flour and salt in medium bowl. Gradually stir in the water, mix to a soft dough. Knead dough on floured surface about 5 minutes or until smooth and elastic. Return to bowl, cover. 3. Boil, steam or microwave spinach until wilted, rinse under cold water, drain. Squeeze out excess water, shred spinach finely. Combine spinach, cheese, juice, garlic and mint in medium bowl, season to taste. 4. Divide dough in half, roll each piece on floured surface into 25cm x 35cm rectangle. Divide cheese mixture across centre of each rectangle, top with lamb. Fold top and bottom edges of dough over filling, tuck in ends to seal. 5. 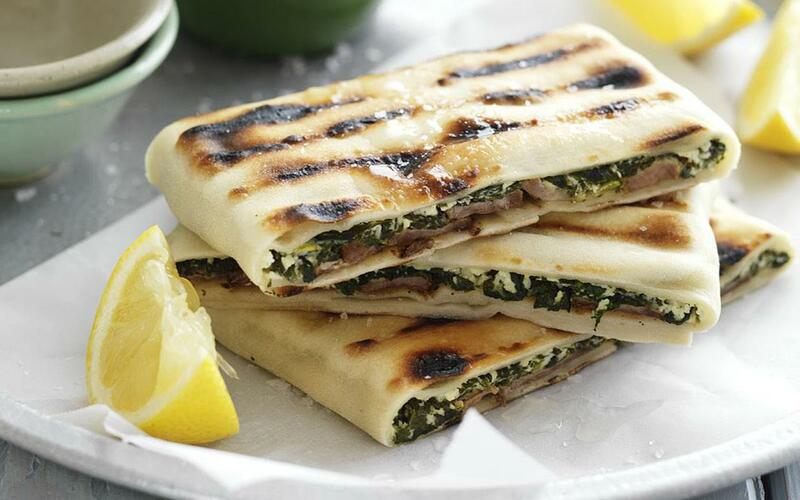 Cook gözleme, both sides, on heated oiled barbecue (or grill or grill pan), over low heat, brushing with the oil until browned and heated through. Stand 5 minutes.